Southern Utah residents can now enjoy the arts outside of a museum with the return of Art Adventures, a program presented by the Southern Utah Museum of Art (SUMA). After successful programs in the spring, SUMA will bring back Art Adventures on Saturday, August 11, 2018. From 10 a.m. to 1 p.m., attendees will learn plein air painting from local artist Mona Woolsey at Cedar Breaks National Monument. The term “plein air” was coined by the French for painting outdoors. This program is $15 for Southern Utah University (SUU) students and members and $20 for not-yet members. This past spring, Art Adventures participants explored land art at Double Negative in Nevada and learned photography tips during a visit to Snow Canyon State Park. The program encourages participants to experience art in the natural world, and plein air painting combines both of these activities. “Plein air painting gives participants a chance to practice their observational skills while capturing the beauty of the landscape,” said Community Engagement Associate, Arielle Altenburg. 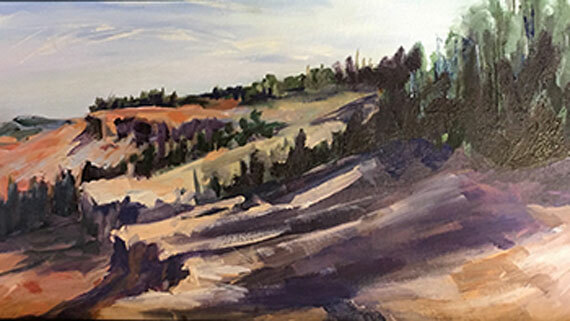 For this program, participants will meet at Cedar Breaks National Monument at the Chessman Ridge Overlook and gain insights from plein air painting from Mona Woolsey. “By learning basic skills, such as composition and simple watercolor techniques, participants will be able to transfer what they see around them into a two-dimensional form,” shared Woolsey. Enjoy the summer scenery in southern Utah with the SUMA’s Art Adventures on August 11. To register for this event, please visit: https://www.eventbrite.com/e/art-adventures-tickets-45342677168. Space is limited.